Homes starting from the $470’s! 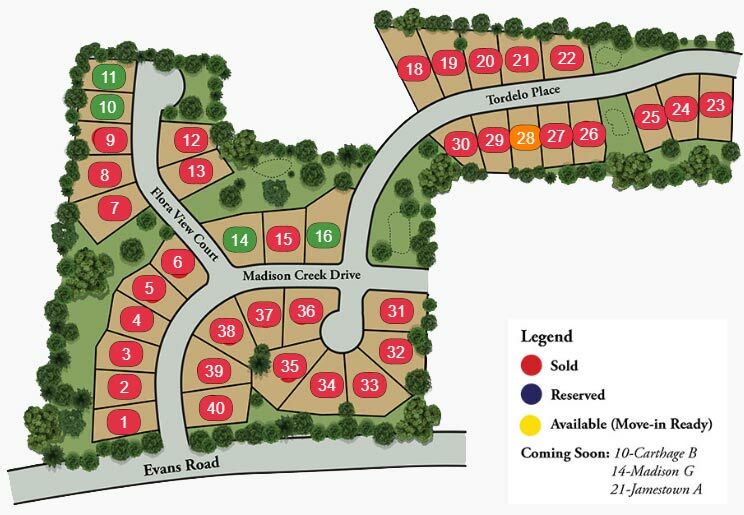 FALL IN LOVE WITH MADISON AT EVAN’S CREEK! Madison at Evan’s Creek embodies the character and values of “Small-town America”, that specializes in classic new home architectural styles by Homes By Dickson. This neighborhood of custom, single-family new homes priced from the $470’s, convenient to the Historic District of downtown Apex, offers forested views and accessibility to close-by parks, dining, shopping, and recreational activities. Madison combines the character of historic style components with current superior, environmentally friendly building standards. Lose yourself in charming streetscapes that encourage outside living and draw neighbors closer to make lasting relationships. Move-In ready opportunities are available! A home should be full of life–your life. At Homes By Dickerson, this is something we always give the highest priority. We begin each relationship by getting to know how you envision using and enjoying your home, looking to your dreams as our foundation. From there, we listen, guide and involve you through the homebuilding journey to build a home that is right for your life. Our process includes creating all the design details that will enhance your experience as a Homes By Dickerson homeowner. We consult with you every step of the way, providing you the flexibility to customize plans and layouts, with the result that you will feel completely at home from the moment you first step through the door. We ensure that not only will your new home be perfect for you, but that it will also be right for the environment. Your home will be Energy Star Certified, crafted to the National Green Building Standard. We are dedicated to the idea that a high performance, green home is not only better for the environment, but a better, longer-lasting value for you. Friendship High School – Conveniently located within walking distance from the new Friendship High School in Apex. Apex Nature Park is Less than 1 mile away from Madison at Evans Creek. Enjoy Nature trails, a dog park for both large and small dogs, 18 hole disc golf course, covered pavilion area that may be rented for parties and events, the amphitheater for concerts and movies after dark and nicely appointed bathrooms. Seymour Athletic fields– Less than 1 mile away from Madison on Evans Road. Multi-aged playground, lighted tennis courts, lighted soccer/Multi-use fields, sand volleyball courts, shelter, and restrooms. Madison is located in Apex just off Evans Road near Humie Olive Rd. close to the brand new Apex Friendship High School. Best to use GPS location of 3019 Evan’s Road, Apex NC.